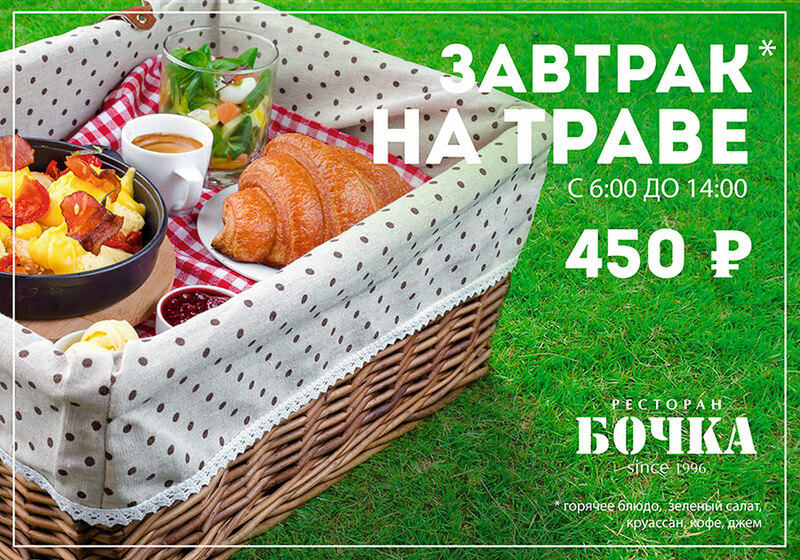 Especially for the summer season Bochka Restaurant has prepared a nice surprise for those who would love to relish an outdoor breakfast experience. You can arrange a picnic right in the centre of the city on the brutal terrace of the restaurant! We will pack up your picnic basket with all you need, including hot country-style scrambled eggs with crispy bacon and golden potato dippers, green salad, crunchy croissant and aromatic coffee. The breakfast menu will be renewed every other week while the price will remain the same – 450 RUB. Breakfast on the grass #vbochke is served from 6am to 2pm. Start your day bright and tasty!